You may not be familiar with using rabbit in cooking, but it is actually the new "super meat"—rabbits have a low impact on the environment and are very inexpensive to raise since they are herbivores and don't require anything extra to fatten them up. And, as we all know, they reproduce like, well, rabbits, so they can be raised and processed quickly. And most importantly, a rabbit is tender, juicy and delicious. As the saying goes, "it tastes like chicken." 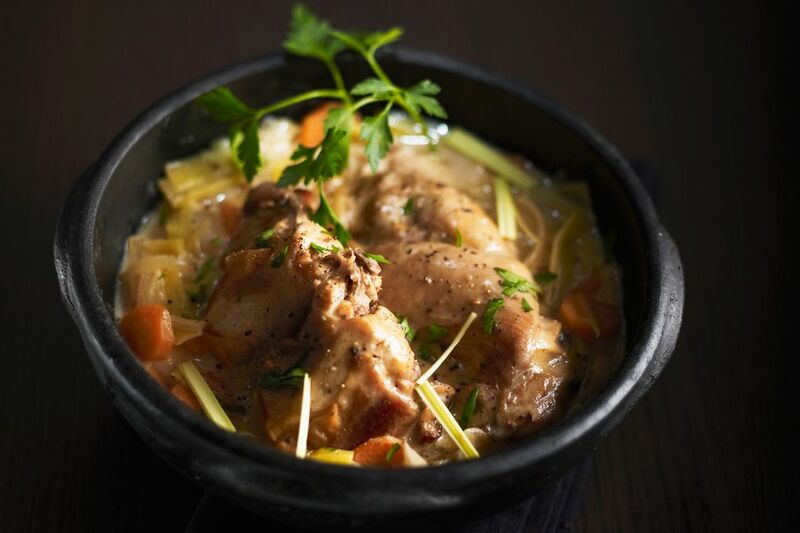 This rabbit stew is a savory combination of cut up rabbit, carrots, and potatoes. Red wine, along with a variety of aromatic vegetables, gives this stew a rich flavor. This recipe calls for a homemade seasoned salt, which is a combination of herbs such as thyme, marjoram, and dill weed as well as garlic and celery salt, onion powder, paprika, curry powder and dry mustard. Serve this stew with biscuits or finish it with easy sage dumplings (see instructions at end of recipe). Note: while there are multiple steps to this recipe, this stew is broken down into workable categories to help you better plan for preparation and cooking. Dredge the rabbit pieces with the 1/2 cup of flour. Melt butter in a Dutch oven over medium heat; brown rabbit pieces on all sides. Add celery, onion, seasoned salt, salt, pepper, bay leaf, 4 cups water or broth, and wine; bring to a boil. Reduce heat to a simmer, cover and simmer for 2 hours. Add carrots, potatoes, and mushrooms. Cook for about 25 to 30 minutes longer, or until vegetables are tender. In a small bowl, combine remaining 1/4 cup flour and 1/3 cup of cold water; stir until well blended and free of lumps. Stir the flour mixture into the broth; cook and stir until the broth has thickened. Serve the stew with biscuits and a salad. If you're making the optional sage dumplings, after thickening the stew, combine 2 cups of biscuit mix in a bowl with 3/4 cup of milk and 1/2 teaspoon of poultry seasoning. Stir with a fork until the ingredients are combined. Drop over the simmering stew and cook for 10 minutes. Cover the pan and continue simmering for 10 minutes longer, gently stirring occasionally to keep the stew from scorching.